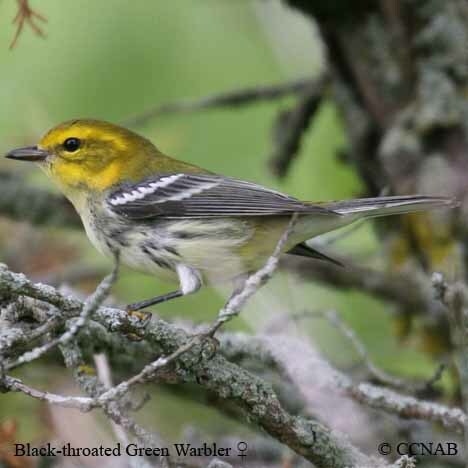 Species: The Black-throated Green Warbler (Setophaga virens) is one of the most common warblers seen in North America. Like all other warblers, the Black-throated Green Warbler feeds on insects. Its habitat can be a mix of deciduous and coniferous or coniferous alone. 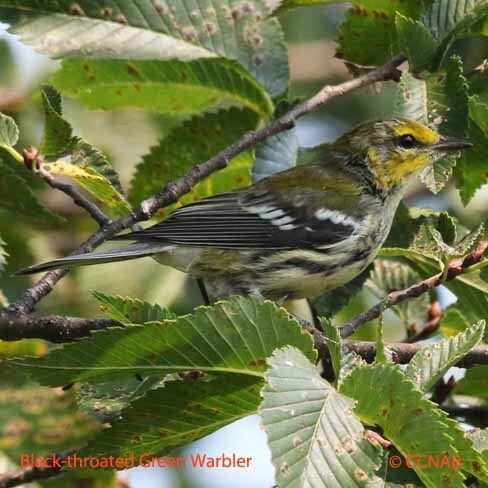 A study has shown this warbler will share the same nesting territory with the Cape May Warbler, Yellow-rumped Warbler, Blackburnian Warbler and Bay-breasted Warbler. This is very unusual but it seems these warbler species all find their food from different parts of the trees. Warblers with similar looks are the Golden-cheeked Warbler, Townsend's Warbler and Hermit Warbler with all showing yellow face markings in various amounts. Distinctions: The male has a yellow face with greenish-yellow auriculars. It has a black chin, throat and wings, with black streaking on its flanks. It has an olive green crown, nape and back. The breast is white with a tint of yellow near the tail. Both sexes have two white wing bars. The female and the juvenile may have a partial black throat or not at all. Their colours may be duller, such as the streaking on their flanks and off-white or slightly yellow breast. Voice: Chipping call, thin sounding notes, sound like "zee, zeee, zee, zoo, zee", continuous calling. Nesting: Three to five white coloured eggs, with brown markings. The nest is usually constructed in a conifer, situated away from the trunk. The nest maybe composed of rootlets, leaves, moss and lined with fine grasses and hair. Distribution: Found from Newfoundland and Labrador through northern Quebec, below James Bay, passing through the center of the western provinces, touching into British Columbia, around the Great Lakes, to far south touching into Alabama, up the eastern coast into the provinces of New Brunswick and Nova Scotia. A few will spend their winter months in southern Florida and southeastern Texas.